It is the night of the 4th July, we are in the middle of a heat wave as well as some amazing World Cup antics, including, just the night before, England winning their first ever World Cup Penalty Shootout vs Colombia to reach the Quarter Finals! 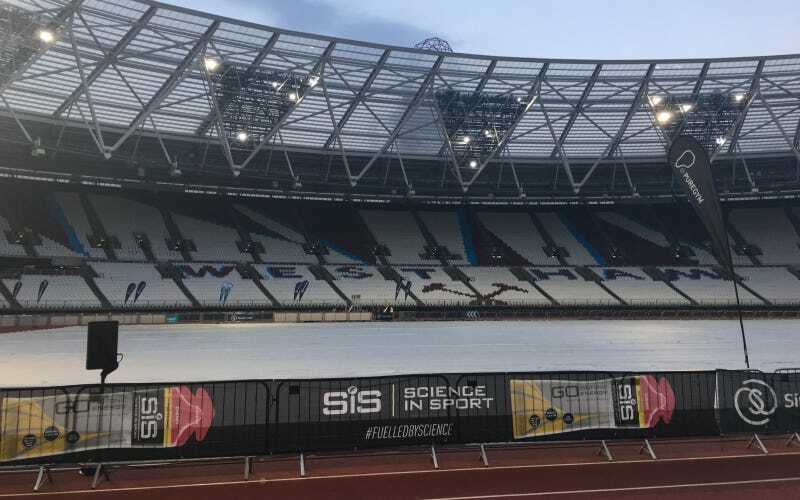 So yes, this means everyone didn't quite get the sleep they wanted, and may have had a few too many beers than they should have, given the important event ahead of them. 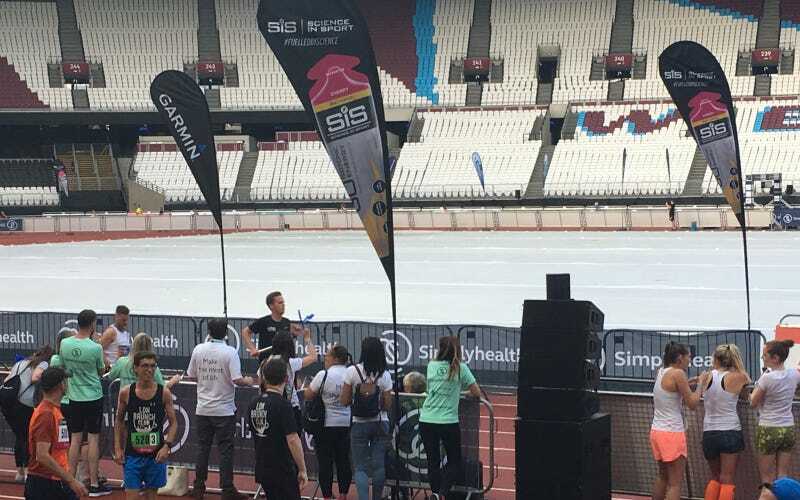 The event consisted of 4 x 5km circuits in and around the London Olympic Stadium, starting on the Olympic track inside the Stadium and looping round the park next to the canals, bouldering walls and training grounds. There were approx 500 teams running and each of the 4 team members do their leg one after the other, passing a baton over to the next after they finish. In FIFA 98 style, over to John Motson and Andy Gray for the team line-up. Strong line-up, John. A lot of potential there, but the question is, can they get over their hangovers from last night's crazy shootout finale! We were meant to prepare?! Woops! After a rush Google of how to get there at 5pm we realised we may be a bit late, so rummaged around for some SiS kit to wear and raided the shelves for product. Luckily we had a wealth of nutritional support to help us over the line that supported our differing preference of fuelling strategies. I opted for a Berry Go Hydro during the day, a Cola Go Energy + Caffeine Gel about 40 mins before, and another Go Hydro Pineapple & Mango after (just before the beer). Martin went with a Tropical Go Isotonic Energy Gel for before, and a new Peanut Butter WHEY20 after. Matt kept it simple with just an Apple & Blackcurrant Energy + Protein Bar on the journey over, but then after a casual Macy Ds in Westfields opted for a Chocolate REGO Rapid Recovery instead of the McFlurry. 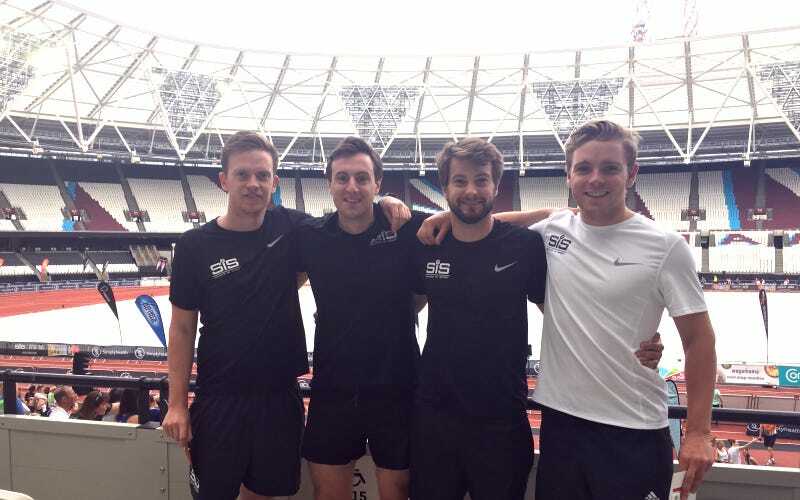 Ed used his stash of Orange Go Electrolyte to sip during the journey over, an Apple Go Isotonic Energy Gel just before the run and Berry Go Hydro in the stadium. So Martin up first, hanging to the back to try and clear some space from the 500 strong group ahead and try and cross the line actually running. Getting off to a slow start due to the crowds, he picked up the pace overtaking probably a few hundred people as he headed round the course. Coming over the finish line his Garmin said he did a solid 22 mins, a great start! I was up next, having to shout over at Martin to get him to pass the baton over as he hasn't seen me (think he just wanted to do the next leg as well!). Starting round the Olympic track I ducked into the underground tunnels under the Stadium, with music blasting around the tunnels, weaving in and out of people thinking I've started well. But as I pass the 1 km mark my watch beeps to tell me I've done it in a whopping 5 minutes! Where was the adrenaline kick!? Looks like I need to pick up the pace. Running along the canals, next to a bouldering wall I didn't know existed and up a few annoying hills that had just a slight incline, just enough to make you grimace, and I'm into my stride with the next few kms at a steady 4.30 pace. 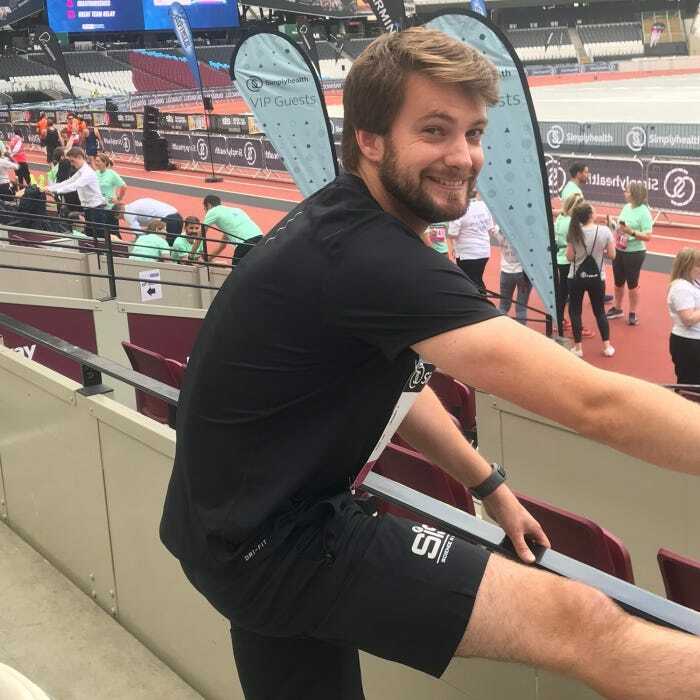 With a sprint finish (which I'm pretty sure I did quicker than Usain Bolt, but was told otherwise later), I crossed the line and handed it on to Matt, who clearly hadn't got the memo about all black with his white shirt on. Being more accustomed to sitting on a Specialized saddle, we didn't know what to expect from Matt "The Beast" Bundy. But he pushed himself and did a very good time of around 21 mins. Next up, the dark horse, Ed Brady! Could he beat his crazy PB of 16:16? Probably not, given that was a good 10 years ago, and few stone lighter... But he still nailed it coming somewhere below the 21 min mark, and had a nice cold beer waiting for him at the finish. A solid performance from the team, and after a couple of selfies and pics with our branding in the background, we had a nice couple of beers swaying along to the Calvin Harris looking DJ (playing Fleetwood Mac...). But all we really wanted was to know the official results! We would have to wait until the next day to find out. A few sore legs walked into work the next day. Sore but worth it! We were eagerly awaiting the results to come out to see our official times and how we faired against all the teams, hoping we were somewhere around the 50th mark. They were out by lunch! That gives us a combined time of 1:29:35 (including some handover time). A very good performance, each member getting better and better! So how did we go matching up to the rest of the field? Around the 50th mark we were hoping for? Answer: Yes! 54th, in fact, out of 437 Men's Teams. 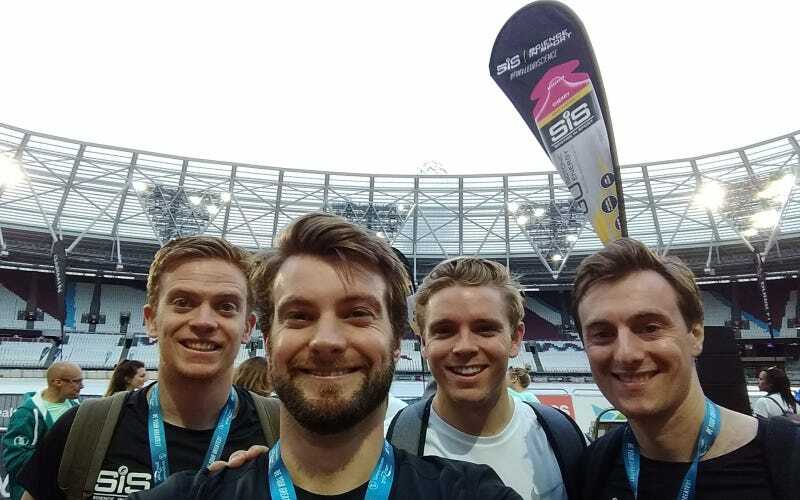 All in all an extremely enjoyable night, thanks to Great Run Company for the entry and hosting us at a very well planned and constructed event. We will be back next time, and might actually train for it then!